Street Level Wall Maps - City. Extent: Heuwelsig, Bloemspruit, Blomanda, Kwaggafontein. This first edition detailed street-level wall map of Bloemfontein is at an easy-to-read scale of 1:25 000. The map includes the major suburbs of Magaung, Fichardt Park, Estoire, Langenhoven Park and Bloemfontein CBD. The map content includes major and main roads with route markers, suburb boundaries, dams, lakes and other water features are named. The wall map is great for planning, seeing overviews or pin-pointing exact locations. Extent: Durbanville, Stellenbosch, Gordons Bay. Includes Wellington, Paarl and Franschoek. This map is made up of 12 sheets showing street level detail from Table View in the north to Glencairn in the south. It also Includes Stellenbosch, Somerset West, Strand and Gordon's Bay as well as an inset of Parklands. Extent: Hillcrest, Ballito and aManzimtoti. Detailed wall map of Durban. Coverage area includes north - Shaka's Rock, west - Botha's Hill, south - Warner Beach. provincial heritage sites and nature reserves and parks. Includes a detailed index of old and new street names. Extent: Tembisa, Randfontein, Dalpark, Nigel. Revised and updated, with suburb boundaries. This map is made up of 12 sheets showing street level detail. Coverage is from Halfway House in the north to Alberton in the south and Randfontein in the west to Nigel in the east. Extent: Tembisa, Springs, Nigel, Germiston. Kempton Park in the north to Vosloorus in the south and from Germiston in the west to Nigel in the east. Extent: Cosmo City, Orlando East, Ennerdale, Krugersdorp. the north to Ennerdale in the south and from Krugersdorp in the west to Florida in the east. Extent: Kyalami, Alberton, Walkerville, Diepkloof. in the north to Alberton in the south and Florida in the west to Bedfordview in the east. This is a street level map showing Port Elizabeth from Uitenhage in the north to Summerstrand in the south. Extent: Central, Silver Lakes, Tembisa. Atteridgeville in the west to Mamelodi in the east. 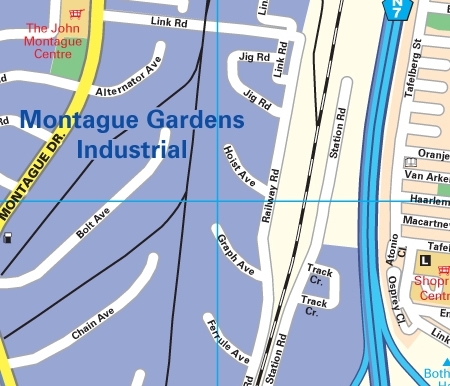 Sample of Detail from portion of the Cape Town Large Map. All of the above maps have similar detail. Sample of Detail / Enlarged.